Returning to home soil. Photo courtesy of Key West History. It's Oct. 31, 1960, and the SS City of Havana, an automobile and passenger ferry that began life as a Second World War landing craft carrier, is easing to its berth at Safe Harbor in Key West, Florida. Sixteen years earlier, this vessel, then known as HMS Northway, carried amphibious trucks and their Canadian and British crews to Juno Beach in the Normandy Invasion. But on this day, those aboard are fleeing, not approaching, conflict. Of the 287 passengers, 232 are Cuban citizens who hold United States residence permits, key to their own economic and political safe harbour. Also aboard are 86 cars, of which most belong to the U.S. embassy in Havana. After imposing an embargo on trade with Cuba in retaliation for the Castro government's seizure of U.S. property and alignment with the Soviet Union, the United States now is cutting diplomatic ties. 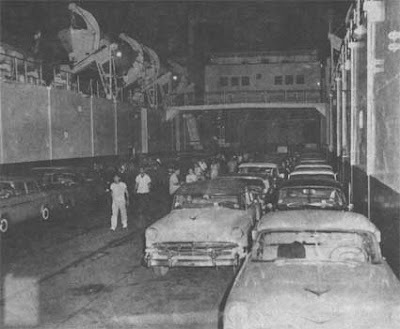 This photo, taken upon the City of Havana's arrival and provided by Key West History magazine, shows rows of government-issue Ford and Chevy sedans, awaiting repatriation. In coming years, many more Cuban citizens will find their way to Florida. But this is the ferry's final trip between Key West and Havana, and these will be the last cars out of Cuba. That's a very interesting find! It's hard to come across photographs of this time. I guess, in the years before this photo was taken, the ferry carried so many cars only on the way TO Cuba, as all the cars on the island except the few that were assembled from parts, arrived via a ferry-ride. Thanks, Ralphee. I've found some more information about the ferry service and the SS City of Havana, and intend to post it soon. I rode this ferry in 1957 on a trip to Havana. What a wide open place that was when you were 18 years old. Sounds like quite the adventure, Anon. !